In our house, we consider "fancy dates" ones on which we don't go shopping at Target. Who knew there was such a thing, albeit a different kinda meaning, right in the Trader Joe's refrigerated produce section? 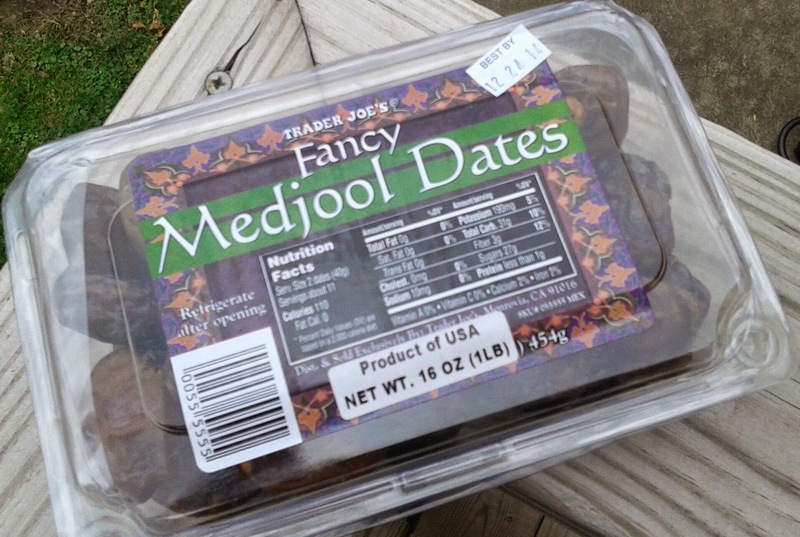 Yup, we're talking TJ's Fancy Medjool Dates. I don't see what's so fancy about them...no bowties or bejewels or bling or anything. It's just a box of wrinkly, pitted dates. But oh, the possibilities! I kid you not. First off, these dates were an absolute joy to just eat right out of the box. Sandy, Big Girl M, and I happily spent one morning late last week chomping thru nearly half the container, all of us together partaking in the slightly sticky, little bit gooey, totally tasterrific natural morsels of delight. I'm not too experienced when it comes to dates (my high school was too busy with video games and Creed - oh wait, wrong kind again) but I can't imagine these medjool munchies to be much if any different than most. Of course, though, with a little work and adaptation there's so much more you can do. Everytime I mention my primarily paleo to a fellow caveperson wannabe, they mention "Bacon wrapped medjool dates!" as if the skies parted and angels streamed down whenever these were consumed. I have failed to make those thus far, but did happen to have some cooked bacon on hand that morning we had a family munch time. Even from my semi-half buttcheeked approximation, I could tell this was a match worthy of the raves. Yum-yum-yummy in my tum-tum-tummy. Yes I watch too much kid programming these days. 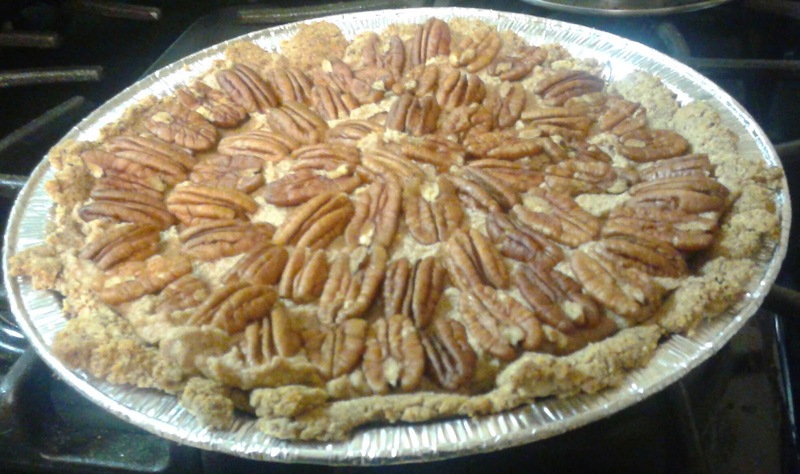 Even better still: Paleo pecan pie. I kid you not. That's the number one reason I got these dates, and dangit, to me, it's just not Thanksgiving without pecan pie. This is the recipe I used (easy as can be! - though I used just a regular egg, I'm not crunchy enough to know what a "flax egg" is) and while texturally the pie was much different than it's usual corn-syrupy incarnation (oh so good! ), the taste itself was almost spot on, with the dates supplying all the sugary sweetness. The pie was so good, with the dates being such an easy, key ingredient, that I got another box of them in the fridge now just waiting to be turned into my next pie. Truth be told, at the risk of being labelled a heretic, I enjoyed the pie much more than the cookie butter cheesecake, although that was pretty good as well. I say medjool dates at the big local chain being sold for something like $7 a pound, so this box for $4.49 strikes me as a pretty reasonable deal. I'm sure we'll continue to buy these - nothing wrong with a new fruit that all of us can enjoy together. Nothing too much more to say, just give 'em a try if you haven't already, and always, we're open to suggestions if you leave a comment or two.